The third sequential hearings of the case of the lawyers from the Contemporary Lawyers' Association (ÇHD) and People's Law Bureau (HHB) have been held at the İstanbul 37th Heavy Penal Court in Silivri Courthouse. In the trial of the 20 lawyers, with six of them being under arrest, the three hearings of the sequential hearings were held between March 18 and March 20. The court has announced its verdict without taking the lawyers' defenses as to the accusations. "No more subjects to examine"
When announcing the court's verdict, the presiding judge said, "As there are no more subjects to evaluate, the open trial has been ended." Ahmet Mandacı, Zehra Özdemir, Ayşegül Çağatay, Yağmur Ereren, Didem Baydar Ünsal, Yaprak Türkmen, some of the lawyers who were being tried without arrest, have been sentenced for "willingly and knowingly aiding a terrorist organization," upon the Articles 314-3 and 227-2 of the Turkish Penal Code. The court reduced the sentences Mandacı and Özdemir by one-sixth because the two defendants were present at the hearings, sentencing them to 2 years, 13 months and 15 days in prison. The period when they were held arrested will be deducted from their prison terms. The court also lifted the lawyers' bans from traveling abroad. Çağatay, Ereren, Ünsal and Türkmen have been sentenced to prison for 3 years and 9 months. The court did not reduce their sentences. The court has also ruled that two fugitive defendants Oya Aslan and Günay Dağ's case shall be separated and stay open as their defenses have not been taken yet. "Membership of a terrorist organization"
All other defendants have been sentenced to "membership of a terrorist organization" as per Article 314-2 of the Turkish Penal code. Lawyer Barkın Timtik has been sentenced for "founding and managing a terrorist organization" upon the article 314-1 of the Turkish Penal Code. All others have been sentenced for "membership of a terrorist organization" upon Article 314-2 of the Turkish Penal Code. Ezgi Çakır: 8 months in prison. Because Çakır has a small child and her spouse is a fugitive defendant, a house arrest has been given for her. Today's hearing began at 10.30 p.m., with more than 100 gendarmerie officers, relatives of the defendants, journalists and two undetained defendants being present at the court hall. The court requested their defenses as to the accusations from Ahmet Mandacı and Zehra Özdemir. Both stated that they want to raise defendants when their lawyers are with them. Mandacı said that his wife is his attorney and she has a report that says she is at the hospital because of giving birth. Özdemir said that there is a restriction order on the case, hence her attorney Bahattain Özdemir cannot raise a defense at this point. Other defendants and their attorneys were not present at the court hall. The presiding judge, after asking the two defendants their last words, pronounced its interim verdict and gave a break until 12 p.m. before announcing the verdict. In yesterday's hearing, the court asked the defendants to prepare their defenses as to the accusations. But the defendants did not raise a defense stating that the case has not come to the defense phase and that their requests have not been evaluated. The defendants demanded the recusation of the judge. The court rejected the recusation demand and ended yesterday's hearing, stating that defenses would be raised today. The defendants' lawyers brought their recusation demand to the upper court. The İstanbul 1st Heavy Penal Court has not made a ruling on the application yet. Of the arrested defendants, Selçuk Kozağaçlı, Engin Gökoğlu, Barkın Timtik, Aycan Çiçek, Aytaç Ünsal and Behiç Aşçı and the defendants who were being tried without arrest did not attend today's hearing. Kozağaçlı, Gökoğlu, Çiçek, Ünsal and Alçı have been on a hunger strike for 56 days to draw attention to the unlawfulness in the trial. 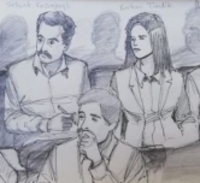 At their hearing on September 14, 2018, the İstanbul 37th Heavy Penal Court ruled for the release of the lawyers Ahmet Mandacı, Aycan Çiçek, Ayşegül Çağatay, Aytaç Ünsal, Barkın Timtik, Behiç Aşçı, Didem Baydar Ünsal, Ebru Timtik, Engin Gökoğlu, Naciye Demir, Özgür Yılmaz, Selçuk Kozağaçlı, Süleyman Gökten, Şükriye Erden, Yağmur Ererken, Yaprak Türkmen and Zehra Özdemir. However, less than 24 hours after a verdict of release was given for them, the board of the court was changed and, in the meanwhile, the Prosecutor's Office objected to the verdict. The new court board ruled that six of the released lawyers should be arrested again. After spending one day outside the prison, six released lawyers were re-arrested and sent to prisons in different provinces of Turkey. The arrest warrants issued against lawyers Günay Dağ and Oya Aslan have still been in effect.